The Joy Bus is a Not for Profit organization whose sole purpose is to relieve the daily struggles of homebound cancer patients with a fresh Chef Inspired meal and a friendly face. Our vision is to elevate the livelihood of our patrons with the joy of culinary sustenance. Founded in 2011 and named in honor of our dear friend Joy who struggled with the painstaking side-effects of cancer, ultimately losing her life to this horrific disease. Joy suffered from cancer in the 4 “L” s (in Joy's words) “Lungs, Liver, Lymphoids and Loveries”. Her drive and determination are inspirational to all those who fight her same battle and if a hot meal and a little compassion can brighten her day then it’s the least we can all do as humans and as a part of a community. Millions of cancer patients are left to fend for themselves during this turning point in their lives. The Joy Bus will relieve the burden put on families during this time by providing healthy meals specified to meet our patron’s needs. The Joy Bus delivers not only quality meals to your doorstep but compassion and a smiling face. Now open in Phoenix, The Joy Bus Diner™ is a 100% nonprofit restaurant that’s helping make our Valley a tastier, happier place, one meal at a time. 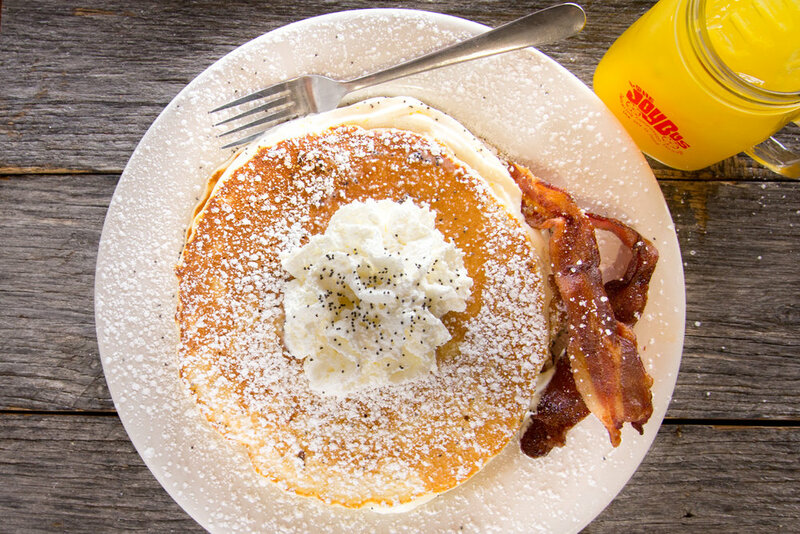 Serving hearty, made-to-order breakfast and lunch fare every Tuesday – Sunday from 7am – 2pm, every cent earned will be used to support The Joy Bus, a local charity that’s been bringing chef-inspired meals and caring conversations to cancer patients Valley-wide. Founded and operated by Jennifer Caraway, The Joy Bus Diner™ is the culmination of her five-plus year effort to improve the lives of local cancer patients through the power of a hand delivered meal and face-to-face interaction. Inspired by a friend named Joy who had been diagnosed with ovarian cancer, Caraway started dropping off home-cooked dinners and chatting with local cancer patients in need of a little good cheer. Over time it expanded into Valley-wide non-profit organization named The Joy Bus, which collects and cooks donated food for volunteers to deliver to patients around the Valley in need of a friendly face and an open ear. Most important, Caraway says, she’s been embraced by the local food community, with Crooked Sky Farms and others donating fresh food, while chefs including Tracy Dempsey (Tracy Dempsey’s Originals), Gio Osso (Virtu Honest Craft, Nico) and Bernie Kantak (Citizen Public House, The Gladly) all serve on The Joy Bus Board of Directors, and Fox Restaurant Concepts donating both financial support and culinary expertise.